The Mother of God Church is located close to Beach Road and is more popularly and locally known as Valiyapally. The church is strategically located near the Beach Road making it an oft visited attraction. The church serves as the main center of worship for the Roman Catholic congregation in Malabar. The history of the church dates back to 1513, which marked a new beginning for the Catholic diocese in the area. The church has undergone quite a few renovations over the years and became a cathedral in 1923. The highlight of the church would have to be its architecture. The curved arches on the doors and windows as well as the colonnade on the spires are a testament to the prowess of the Italian architects that built the edifice. Inside, there is a 200-year-old portrait of St. Mary that adorns the wall of the 18th century Gothic cathedral built by Christian missionaries. In the adjoining cemetery, one can find a number of ancient tombstones, the most popular of which happens to be that of Pedro de Covilhany, the first Catholic missionary to set foot in Kozhikode. The neo- Roman architectural style of the elegant structure is prominent in the exterior which is surrounded by lofty, square towers on either side. How popular is Mother Of God Church? People normally club together Mananchira Square and Dolphins Point while planning their visit to Mother Of God Church. The church built by Portuguese which has got a serene vibe.. Good architecture.. Statues are also good..
A wonderful antique church built by the Portuguese and later renovated. A calm and serene atmosphere fills the air... A beautiful place to spend hours in prayer. Positive vibes with some mellow ambiance. Situated near the silk street. The mother of god church locally named as valliyapalli. This church represent the epic history of our land. Roman architectural style dates back to 1513 AD and is the only one of its kind in Kerala. A 200-year-old portrait of St. Mary adorns the wall of the 18th century Gothic cathedral built by Christian missionaries. The church is the headquarters of Roman Catholic congregation in Malabar. Designed by Italian architects. Each pace through the corridors of church will be a feast to the visitors. This holy shrine is a tribute to Italian architects and the skill of Indian craftsmen. It’s amazing to watch the curved arches on the doors and windows and the colonnade on the spires of the church. The church has been renovated in 1599 and 1724. 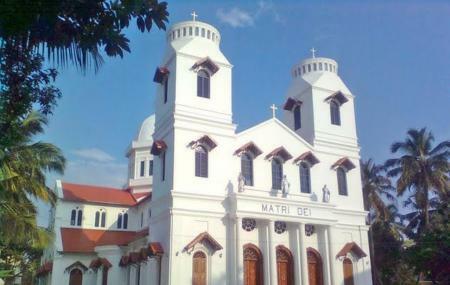 It was in 1923 that the church became the Cathedral of the Diocese of Calicut.